The negotiations between the Troika and Greece are a sham. Greek submission to the neoliberal EU project or forced exit was the Troika game plan from the moment Syriza formed a government. Flickr/taesos greq. Some rights reserved. For five months we have watched the attempt by the government of Greece to renegotiate its debt with the notorious Troika (the European Commission, the European Central Bank and the International Monetary Fund, with the German government very much the 500 pound cliché in the room). Or, so it appeared. We can now know that the reality was and is quite different from appearances. The Syriza government and its creditors are not and were not in conflict over debt servicing, but something much more fundamental in which there could be no compromise. Greece has the only EU government that opposes the alarmingly successful project to solidify a neoliberal Europe. Because of that opposition there will be no "agreement" between the Greek government and the Troika. Indeed, from the moment Syriza formed a government only two outcomes were possible: 1) the replacement of the Syriza government with one again obedient to the neoliberal project, or 2) or expulsion from the euro zone and the European Union. 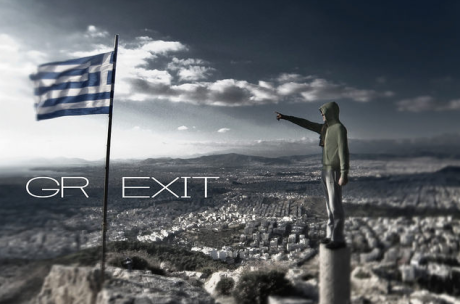 With the Greek government enjoying overwhelming support, expulsion becomes the only possibility. The question for the Troika is, how? The absence of any formal mechanism for expulsion of a member country from either the euro zone or the EU quickly became the central problem of the Troika. This problem would be and will be solved by creating conditions such that it appears that the Syriza government chooses the outcome the Troika desires. That is the real story. It is very simple - force the Greek government to withdraw in circumstances that allow the Troika to deny culpability. Without knowing it, we have been following the manoeuvres by the Troika to achieve that end. The drawn-out nature of the conflict is a Troika strategy, to drain the Greek government of money until it must accept what Prime Minister called "absurd" demands or choose an increasingly costly exit from the euro zone. Time is not on the side of the Greek government. It is standard international practice that governments accept responsibility for debts contracted by previous governments. But they are not obligated to implement the same policies. Unless a debt is illegal or "odious", a new government is expected to pay it under the contracted interest rate, time schedule and other terms, though it may attempt to re-negotiate those terms. Domestic politics determine how it does so. Shortly prior to calling an election for January, the centre-right Greek government that preceded Syriza signed an agreement with the Troika that made disbursements dependent on many specific policy conditionalities. These conditionalities were in effect the extension of the policies that the Troika had required four years previously, which led to the resignation of the Papandreou government and its replacement without a new election by what many critics, including this author, consider a Troika client regime. These conditionalities did not relate directly to the debts owed by the Greek government. They involved specific policy interventions that the Troika designed, and justified on the grounds the measures would facilitate debt service, debt reduction and economic recovery. When the January 2015 election occurred the Greek economy had achieved none of the goals or targets of the Troika policy conditionalities. A trade surplus represented the only "success" of the Troika policy package, and this was achieved by the collapse of household income and imports, not a "competitiveness" driven export surge. The Syriza Party's platform explicitly rejected the most important of these conditionalities. Therefore, there can be no dispute that the Greek electorate provided a democratic mandate to the new government to change policy. This was not a unique or even an unusual situation. Numerous governments in Asia, Africa and Latin America have renegotiated conditionalities associated with IMF and World Bank lending, including ones by governments that I have advised (Zambia over the last ten years is a clear example). Operating on standard international practice, the Syriza government sent its representatives to Brussels in February 2015 with a detailed proposal for debt servicing consistent with its electoral mandate. The normal reaction by creditors and debt monitoring institutions would have been to agree to some proposals and reject others. Because almost all the Greek government debt had been converted to obligations to the European Central Bank and the IMF, the "creditors" consisted of the ECB and the IMF, with the finance ministers of the other euro zone countries in effect serving as the European Commission's policy monitors. Throughout the contentious exchanges, media reports suggested that some among the Troika initially took the positive approach of "decide what is essential, hold to that, and yield on the small stuff". This, the modus operandi of negotiations, frequently reveals that what one side considers important the other does not, which makes for compromises. The German government did not take the usual approach. As early as mid-February, the Greek Finance Minister Yanis Varoufakis accused the "creditor" governments of a lack of flexibility. German Finance Minister Wolfgang Schäuble repeatedly and explicitly confirmed Varoufakis, perhaps most bluntly in April when this right-wing German politician stated publicly that "no one expects there will be a solution". Evidence suggests that differences may have emerged among that the members of the Troika. Given that euro zone finance ministers numbered well into double digits, complete agreement seems unlikely. One of the more popular rumours, for which there is little supporting evidence, held that the EC president Jean-Claude Juncker was the "good cop" to Wolfgang Schäuble's "bad cop". Another rumour speculated that the IMF was flexible on debt rescheduling but not on policy conditionalities (publicly denied by the head of the IMF), with the reverse position held by the ECB and the finance ministers. The inconsistencies among these rumours suggest to me that they were part of an orchestrated campaign to generate the illusion of Troika flexibility and Greek government intransigence. If any hopes remained that the faux negotiations had a positive purpose they should have ended on 2 June. This cloak-and-dagger gathering of the major members of the Troika, in the absence of the finance minister bit players, demonstrated who was in charge. When the heavy weights of the Troika allowed no representative from the Greek government to attend - indeed, did not inform the Greek government of the meeting - the political logic of the new EU order revealed itself. Euro expulsion or euro escape? Grexit to the leftFrom that secret meeting came a Troika document of a few pages that was formally passed to the Greek government. The only surprising aspect of that document is its excessive length, because it conveyed a very short and clear message - implement the pre-election economic policies that we, the Troika, designed and to which previous governments acquiesced. At the beginning of June the Greek government had a payment to make to the IMF. Given the inflexibility of the Troika, the announcement by the Greek government to use a procedural device within IMF rule to postpone payment is the rational response. I do not interpret this as a move of desperation by a "cash-strapped, bankrupt" government. Rather, it reflects the need to conserve euros for the long-expected transition to a national currency, when the euro like the dollar will be part of the government's foreign exchange reserves. The Greek public debt cannot be paid in full and will not be. Even the cast-iron austerian Wolfgang Schäuble must know that. Greek government submission to the neoliberal EU project or forced exit was the Troika game plan from the moment Syriza formed a government. Soon the negotiations that-never-were will no longer be. 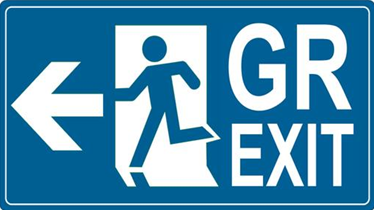 The challenge facing the Greek government will be to convert expulsion from the euro zone into escape from neoliberal Europe.